1. Zotero and Word communicate to create bibliographies based on the items you have loaded into your Zotero library. When you install the Zotero library, this functionality is automatically added. You will know that the Zotero word processing option has been added if when you are using a PC with Microsoft Word 2007 or newer you find the Zotero icons in the Add-Ins or Zotero tab. If you are using a Mac, you may find the Zotero tools under the Word script menu or in a Zotero menu. Note: the Mac icons often look slightly different than the PC icons, but the functionality is the same. 2. To insert an in-text citation, click where you would like the citation to go within the text of your document, and then use the add citation icon. 3. Next, choose your preferred citation style. Just a note – adding additional citation styles is covered in a later module. 4. Then choose the appropriate item to cite your idea. You are given a search box that lets you enter any information that you know about the citation you are looking for – the keywords from the title, tags or an author’s name. After you have chosen the appropriate citation, hit enter on your keyboard. 5. If you would like to add a page number or suppress the author's name (if you have already used the author's name in the sentence), click on the citation within the Zotero add in-text citation box. A dialog box will appear. You can now make those changes to your in-text citation. 6. You may add citations another way, via "classic view." 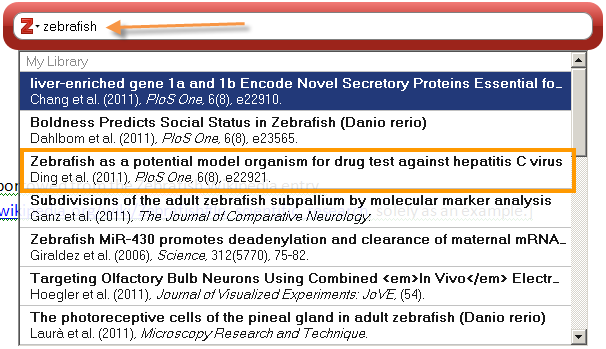 After choosing the "insert citation" icon, click the red Z on the search bar that opens up, then choose "classic view." Classic view allows you to browse through the citations in your library. I find it easier in classic view to find citations if I don't remember the name of an author or the exact key words. You can also suppress the author or add page numbers from this view. 7. You may also add multiple items to the same citation. You may add multiple sources in either the search bar or in classic view. 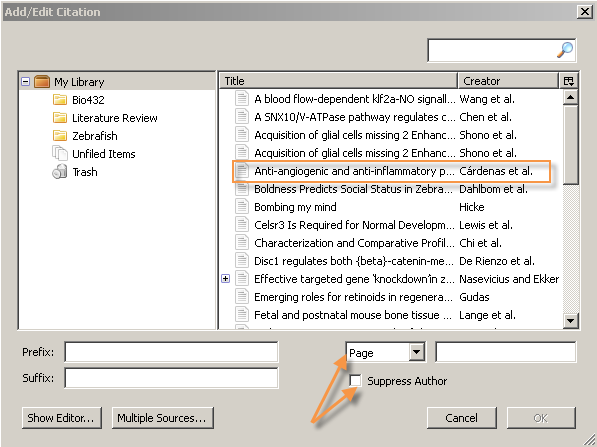 In the search box view, simply choose as many citations as you need, then hit enter on your keyboard when you are finished. 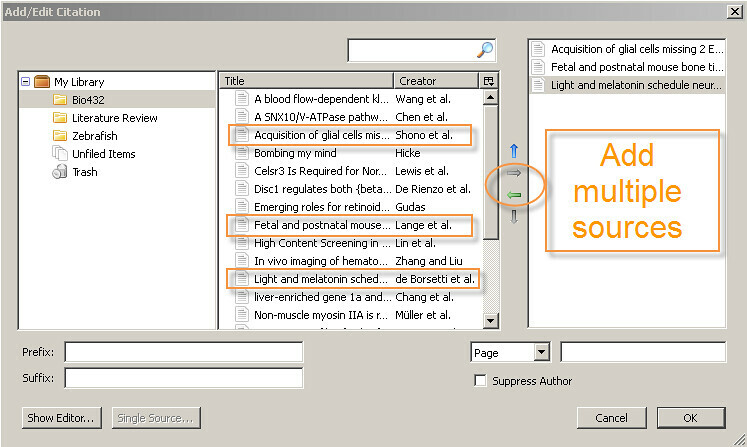 In classic view, choose “multiple sources” on the lower left. Choose each item that you want to use for this citation, then click the green arrow to add it to the citation. 8. Now add the bibliography or references list. 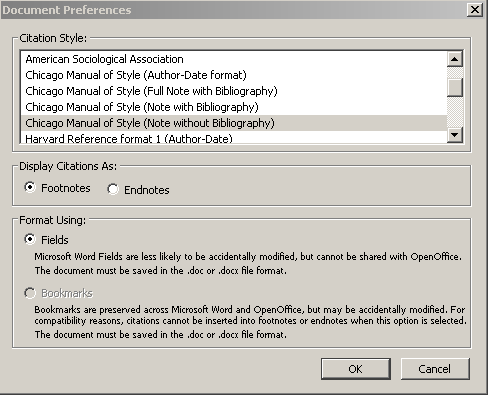 Start your bibliography below your text, then choose add bibliography from the Zotero icons. 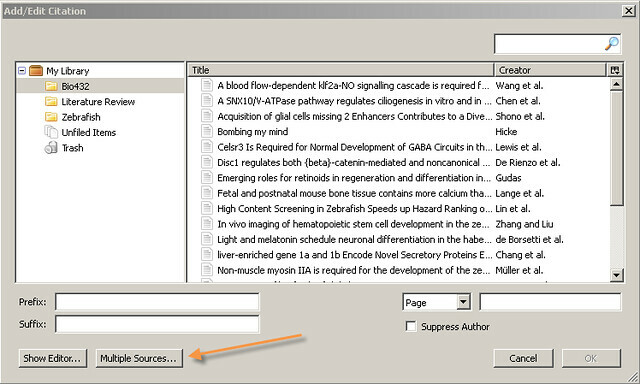 The bibliography will be automatically generated in the citation style you earlier chose. 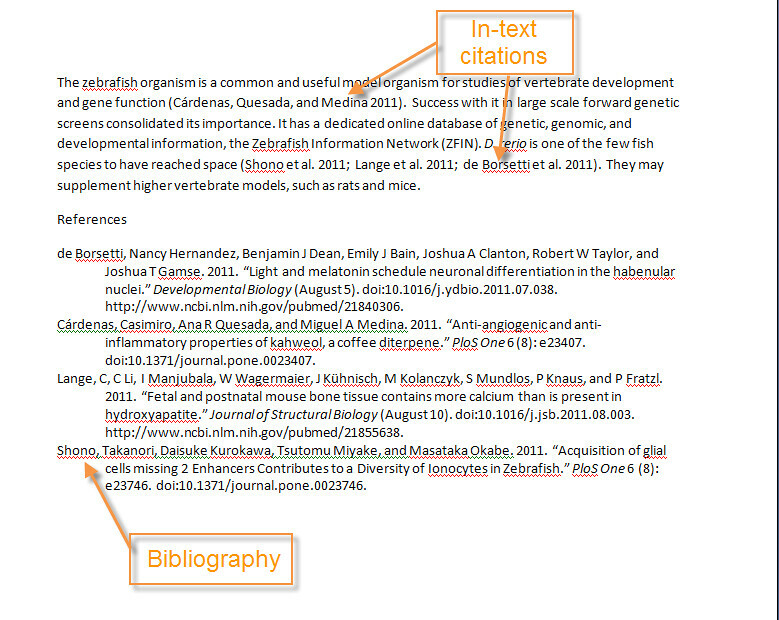 As you add more in-text citations to your text, these will be added automatically to your bibliography.